Received July 23, 2018; Revised August 15, 2018; Accepted August 15, 2018. Five concentrations of 2,4-dichlorophenoxyacetic acid (2,4-D) and three combinations of indole-3-acetic acid (IAA) and benzyl-amino purine (BA) were used to analyze response to mature-embryo culture for six genotypes of wheat (Triticum aestivum L.) The differences between genotypes as well as between the concentrations of hormones were significant for three tissue culture traits, namely callus formation (C.%), embryogenic calli (E.C.%) and plant regeneration per embryogenic callus (No. Sh/E.C.). Murashige and Skoog basal medium (MS) supplemented with 7 mg/L 2,4-D showed the highest percentage of callus formation while the highest percentage of embryogenic calli (% of E.C.) was obtained on MS medium supplemented with 4 mg/L 2,4-D. MS medium containing 0.1 mg/L IAA and 1 mg/L BA exhibited the highest number of plant regeneration (No. Sh/E.C.). A half diallel mating was designed to produce 15 crosses among six genotypes. Mean square of the diallel analysis of variance indicated highly significant differences among the parents and F1 hybrids for E.C.% and No. Sh/E.C. traits. The results revealed that Lin-6 (P4) was the best combiner for E.C.% and No. Sh/E.C. Estimates of narrow-sense heritability were 83.1% and 69.0% for E.C.% and No. Sh/E.C., respectively. The genetic diversity among six wheat genotypes was analyzed using three tissue culture traits, 10 agro-morphological traits and three molecular marker systems. The Mantel test showed a positive and significant correlation between tissue culture traits studied and each of agro-morphological traits and molecular marker systems. Wheat (Triticum aestivum L.) is one of the major cereal crops cultivated worldwide. Currently, wheat productivity has been dwindled due to environmental stresses (Joshi et al. 2007). Traditional breeding might not be that efficient for developing cultivars capable to overcome such stresses. Tissue culture techniques are promising alternatives and effective methods for wheat breeding. Many factors are involved in callus formation and plant regeneration in wheat e.g. genotype (Shahnam et al. 2017), explant (Mahmood and Razzaq 2017), type and concentration of growth regulators (Salama et al. 2013; Kowalska and Arseniuk 2016; Saha et al. 2017), medium components (Greer et al. 2009) and physiological status of the donor plants (Ren et al. 2010). Several types of explants were used successfully in wheat tissue culture, e.g. leaf segment (Yu et al. 2012), meristematic shoot segment (Sharma et al. 2005), shoot apical meristem (Haliloglu 2006), endosperm supported embryo (Aydin et al. 2011), anther (Lantos and Pauk 2016) and immature embryo (Jia et al. 2009). However, a mature embryo is the best explant for wheat in vitro culture. Among its advantages are ease of handling, ease of storage and its availability in bulk quantities (Yu et al. 2008). Meanwhile, the main obstacle of the mature embryo is its low % plant regeneration (Chen et al. 2006), although it has been used widely in many wheat studies (Chen et al. 2009; Aydin et al. 2011; Mahmood and Razzaq 2017). Tissue culture traits are predominating and can be used in combination with other agro-morphological characters for crop improvement programs. The successful molecular plant breeding programs depend on the efficiency of plant regeneration in vitro. The type of genetic control of callus induction and plant regeneration ability in wheat is an essential aspect for many predicting the response to mature embryo culture to be used in further selection (Zamani et al. 2003; Abdel-Hady 2006). Evidently, both additive and dominance gene effects were reported to be controlling embryogenesis and plant regeneration (Lazar et al. 1984; Lange et al. 1995). Apparently, Barakat (1994) concluded that non-additive gene action was predominant in the control of callus formation than the additive effects. He also found that genotypic correlation between plant regeneration and callus formation was higher than the estimated phenotypic correlation, revealing the importance of the type of genetic associations. Assessment of genetic diversity among and/or within populations, using morphological, biochemical and molecular markers is very important in crop breeding (Khan et al. 2013; Kaddem et al. 2014). DNA markers are the best technique to assess genetic diversity between or within populations as they are not affected by the environment. The markers currently available for assessing such diversity vary in their principle, application, type, amount of polymorphism detected and in task and time requirements. Some molecular markers were efficient in wheat diversity assessment, e.g. Inter-simple sequence repeats (ISSRs) (Najaphy et al. 2012; Abou-Deif et al. 2013), Random amplified polymorphic DNA (RAPD) (Khavarinejad 2014; Tonk et al. 2014) and Sequence-related amplified polymorphism (SRAP) (Khaled and Hamam 2015). The objectives of the present study were to a)- analyze the response of wheat genotypes to mature-embryo culture b)- estimate the genetic diversity among the wheat genotypes c)- assess the relationships among molecular-markers, agro-morphological and tissue-culture traits. This study was carried out during the three seasons of 2014/2015, 2015/2016 and 2016/2017 at the Research Farm and Biotechnology Laboratory of Genetics Department, Faculty of Agriculture, Assiut University, Assiut, Egypt. A total of 15 F1 hybrids (half diallel) along with their six parents were used to analyze the genetic control of response to mature embryo culture. The six parental genotypes of wheat (Triticum aestivum L.), were Pavon-76 (P1), ICR33 (P2), Gimmeiza-7 (P3), Line-6 (P4), ICR35 (P5) and Lera (P6). Mature seeds were washed for 30 minutes under tap water with hand shaking. Then, seeds were washed for five minutes with commercially liquid soap with hand shaking followed by several times rinsing with tap water then washed with distilled water. Under the sterile condition of laminar flow hood, seeds were sterilized as following; ethyl alcohol (95%) for 5 minutes; washed 3 times with distilled water; 100% commercial bleach (Clorox 5% sodium hypochlorite) for 20 minutes with continuous shaking under aseptic conditions; and finally rinsed 3 times with distilled water. Sterilized seeds were aseptically cut with a scalpel without detaching mature embryos from seeds. The seeds with partially attached embryos were placed furrow downwards on the surface of 10 mL of sterile callus induction medium; full strength Murashige and Skoog (MS) medium (Murashige and Skoog 1962) supplemented with different concentrations of 2,4-dichlorophenoxy acetic acid (2,4-D) (Table 1). All cultures were incubated at 26 ± 2°C in complete darkness for 15 days. The sufficiently developed calli (embryogenic and non-embryogenic) were cut and transferred onto regeneration medium; comprised of MS basal medium and three combinations of 6-benzyl-adenine (BA) and indole-3-acetic acid (IAA) (Table 1). The transferred callus cultures were incubated at 25 ± 2°C in continuous darkness for one week then incubated for an additional 5 weeks at 25 ± 1°C under continuous illumination. Response to tissue culture was evaluated according to the following parameters: % total callus formation (C.%), calculated as the percentage of explants produced callus from the total cultured explants. % embryogenic callus formation (E.C.%), calculated as the percentage of explants produced embryogenic callus from the total explants produced callus and number of shoots per embryogenic callus (No.Sh/E.C.). 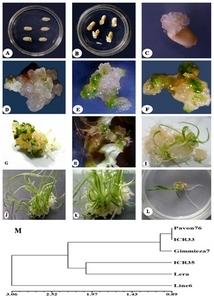 Mature embryos of the 15 F1 hybrids and their six parents were cultured on a suitable media for callus induction (CIM-2 medium) and the embryogenic calluses were culture on suitable media for plant regeneration (RM-1 medium). Tissue culture response was studied as the % of embryogenic callus (E.C.%) and the number of shoots per embryogenic callus (No. Sh/E.C.). A randomized complete block design (RCBD) with three replications was used with each genotype represented in each block by ten vials with seven explants per vial. The collected data were analyzed using analysis of variance (ANOVA) and least statistical difference (LSD) test. Data analysis was performed by MSTAT-C software program (MSTATC, Michigan State Univ., 1992). Euclidian distance coefficient and unweighted pair group method with arithmetic means (UPGMA) were used to construct the dendrogram for tissue culture traits by NTSYS-pc ver. 2.1 (Rolhf 2000). Correlation coefficients between the different characters were calculated for each procedure according to Steel and Torrie (1980). The half diallel method (Walter and Morton 1978) was used to analyze the genetic components of E.C.% and No. Sh/E.C. General and specific combining abilities were estimated according to Griffing (1956b). Ten agro-morphological traits were measured for each individual plant in the field, namely Heading date (HD), Plant height (PH), Grain yield/plant (GY/P), Spike Length (SP L), Number of spikelets/spike (Nspk/SP), Spike weight (SP W), Number of grains/spike (NG/SP), Spike density (SP D), Spikelets fertility (SP F) and 1000 kernel weight (1000 GW). Randomized complete block design (RCBD) with three replicates was used. The plot size was 3 × 3 meters, comprising of 10 rows of three meters each in length spaced at 30 cm apart with seeds spaced 20 cm from each other. ANOVA was performed by MSTAT-C (MSTATC, Michigan State Univ., 1992). The Euclidean distance and cluster analysis were performed using NTSYS-pc ver. 2.1 (Rolhf 2000). Correlation coefficients between tissue culture and agro-morphological traits were calculated for each procedure according to (Steel and Torrie 1980) and Mantel-test (Mantel 1967). CTAB method (Murray and Thompson 1980) with minor modifications was used to extract DNA from fresh leaves of six genotypes (10 seedlings as a bulk/genotype). DNA quantity was measured using UV-spectrophotometer at 260/280 nm and DNA quality was checked on 0.9% agarose gel. Three molecular marker systems, namely RAPD, ISSR and SRAP were used to implement the molecular analysis. The PCR reaction containing 3.0 μL 10X PCR buffer (Promega), 4.0 μL of 25 mM MgCl2, 3.0 μL dNTPs (each 2.5 mM) mix (Promega), 0.3 μL Taq DNA polymerase (5 units/uL, Promega), 11.0 μL dH2O, 2.0 μL of 10 pmol/μL primer for RAPD and ISSR markers and 1.0 μL of each of forward and reverse primer for SRAP marker, and finally 1 μL DNA (25 ug/uL) template. Amplification conditions were carried out in a Lab Cycler (Model SensoQuest, GmbH, Germany) with the following specification; For RAPD and ISSR: 5 minutes at 94°C initial denaturation; followed by 45 cycles of 1 minute at 92°C, 1 minute at (32°C–34°C for RAPD and 38 – 44°C for ISSR, based on primer annealing), 2 minutes at 72°C extension, then 10 minutes at 72°C. For SRAP: initial 5 minutes at 94°C followed by 10 cycles of 1 minute at 94°C, 1 minute at 35°C and 2 minutes at 72°C, then 35 cycles of 1 minute at 94°C, 1 minute at 50°C, 2 minutes at 72°C, and final 10-minute extension at 72°C. PCR products were separated on agarose gel of 1.4% (RAPD), 2% (ISSR) and 2.5% (SRAP) with constant voltage (80 V) for approximately 3.0 – 3.5 hours. The gel was stained with ethidium bromide and visualized using GelDoc-It®2 Imager (www.uvp.com). DNA fragments were scored as absent (0) or present (1). Genetic similarity was calculated according to the Dice similarity coefficient (Dice 1945) and the dendrogram was performed based on this matrix using NTSYS-pc ver. 2.1 (Rolhf 2000). The correlation coefficients between tissue culture, agro-morphological traits, and molecular markers were estimated according to the Mantel test (Mantel 1967). The PIC, MI and RP were calculated as the formula, PIC = [1 − (p2 + q2)] (Ghislain et al. 1999), MI = [PIC × ηβ] (Powell et al. 1996) and RP = [∑Ib] (Prevost and Wilkinson 1999). Calli were formed on the cultured mature embryos after two weeks of culture. Subsequently, globular calli developed and covered the embryos, which turned to putative embryogenic calli (Fig. 1A–H). All genotypes were able to form the callus on the five induction media. However, the percentage of callus formation (C%) varied with medium type (Table 2). As an average, the C.% among genotypes ranged from 94.05 (P5) to 98.52% (P2) whereas the average of the different media ranged from 91.97 (CIM-3) to 99.32% (CIM-5). Significant differences were found among genotypes as well as between induction media (Table 3). Averaged over tested media, the genotype P4 displayed the highest E.C.% (60.89%) whereas P6 showed the least percentage (13.61%) (Table 2). The CIM-2 medium exhibited the highest E.C.% as averaged over genotypes (54.04%). Meanwhile, CIM-5 revealed the least E.C.% (9.07%). These differences among genotypes as well as among tested media were highly significant (Table 3). The CIM-2 medium was the best for callus formation and embryogenic calli from the mature embryos. The embryogenic calli obtained from the tested genotypes were cultured on three types of regeneration media namely, RM-1, RM-2 and RM-3. After about 4–6 weeks of culture on the regeneration medium, the primary shoots and leaves were developed from embryogenic calli (Fig. 1I–L). The highest number of shoots per embryogenic callus (No. Sh/E.C.) was shown by P4 (15.78) as compared to 2.0 shoots by P6, as averaged over regeneration media (Table 2). The RM-1 medium exhibited the highest No. Sh/E.C. (11.56) overall genotypes relative to 4.72 shoots on RM-3 medium. These differences among genotypes as well as among regeneration media were highly significant (Table 3). These results revealed that 0.1 mg/L IAA and 1mg/L BA was the best combination for plant regeneration. Obviously, the C.% was extremely high in all tested genotypes and media. However, the effect of genotype and medium composition was focused on embryogenic calli and plant regeneration. The dissimilarity matrix based on tissue culture traits among the six genotypes ranged from 0.89 between Pavon-76 (P1) and ICR-33 (P2) to 4.61 between Line-6 (P4) and Lera (P6). The range of genetic distance among all genotypes was relatively wide, indicating that remarkable variation in tissue culture traits among the genotypes reflecting the variation of the loci governing callus induction, embryogenic callus, and plant regeneration traits. Evidently, the possibility of choosing genotypes that have a divergent genetic background promotes the probability of obtaining wide segregation for these traits. A dendrogram generated from the standardized tissue culture data is presented in Fig. 1M. The UPGMA showed that the genotype Line-6 (P4) was separated in a single branch from the other genotypes, this genotype had the highest mean values for E.C.% and No. Sh/E.C. The remaining genotypes were separated in two major clusters. Cluster-1 comprised of three genotypes, Pavon-76 (P1), ICR-33 (P2) and Gimmeza-7 (P3) which possessed the highest mean value for percent of callus formation (C.%). Cluster-2 included the two genotypes ICR-35 (P5) and Lera (P6) which had the lowest mean value for percent of callus formation. The percent of embryogenic callus (E.C.%) of the parents ranged from 25.12 (P6) to 89.54% (P4) with an average of 52.95%. On average, the F1 hybrids were 15.08 % higher than the parents with a range from 44.05 (P1 × P6) to 95.42 (P4 × P5) (Table 4). The No. Sh/E.C. in the parents ranged from 5.33 (P6) to 20.33 (P4) with an average of 12.06. On average, the F1 hybrids were higher than the parents (14.84 plants/embryogenic callus) with a range from 10.20 (P3 × P6) to 22.13 (P4 × P5) (Table 4). These differences between the F1 hybrids and their parents were significant as indicated by the significance of “b1” item revealing the presence of dominance directed towards higher E.C. % and greater No. Sh/E.C. (Table 5). Diallel analysis for E.C.% and No. Sh/E.C. revealed the significance of both additive “a” and non-additive “b” genetic variances with the additive effect being predominant in controlling embryogenic callus and plant regeneration traits. Also, the diallel analysis revealed that the “b2” item was significant indicating an equal distribution of alleles affecting E.C.% and No. Sh/E.C. among parents. The significance of the “b3” item indicates the presence of further dominance effects due to specific combinations and/or epistasis. Apparently, certain crosses may produce transgressive segregates in a successive generation, which could be identified. The general (GCA) and specific (SCA) combing ability values for E.C.% and No. Sh/E.C. are given in Table 6. The parent P4 exhibited the highest significant positive value of GCA followed by the parent P5 (23.351 and 2.748, respectively) for E.C.%. Also the parent P4 (gi = 4.408) followed by the parent P2 (gi = 1.558) exhibited significant positive values of GCA for No.Sh/E.C., revealed that these genotypes have the most favorable alleles for these traits. High GCA effects are related to additive or additive × additive interaction effects (Griffing 1956a, 1956b), the components that respond to selection. The specific combining ability effects (Sij) for embryogenic callus (% E.C.) were positive and highly significant in eight crosses being maximum (Sij = 14.095) in P4 × P6 followed by P1 × P4 (11.318), P5 × P6 (9.686), P3 × P4 (7.249), P4 × P5 (5.636), P2 × P4 (4.412), P2 × P6 (4.295) and P1 × P2 (4.077). In addition, the three crosses P1 × P5, P2 × P3, and P3 × P5 revealed significant positive values of Sij (Table 6). Meanwhile, only one cross P2 × P5 exhibited a significant negative value of the Sij. Specific combining ability effects (Sij) for number of shoots per embryogenic callus (No. Sh/E.C.) were positive and highly significant in 6 crosses being maximum (Sij = 3.944) for P4 × P5 followed by P4 × P6 (3.152), P1 × P4 (2.811), P2 × P5 (2.498), P2 × P3 (2.252) and P5 × P6 (1.561). In addition, the two crosses P3 × P6 (1.182) and P1 × P6 (1.127) revealed significant positive values of Sij (Table 6). Whereas, the two crosses “P1 × P5” and “P3 × P4” exhibited significant negative values indicating lower numbers of regenerated plants. The Sij of the other crosses for the two characters were not significant. Such epistatic effects in the E.C.% and No. Sh/E.C. substantiate the significance of the “b3” item (Table 5). The presence of significantly positive GCA and SCA values suggested the utilization of certain genotypes P4 and P5 and crosses (e.g. P4 × P6, P1 × P4, P5 × P6 and P3 × P4) for improving the % of embryogenic callus and the genotype P4 with crosses P4 × P5, P4 × P6, and P1 × P4 for improving a number of regenerated plants per embryogenic callus. Array differences in the Wr + Vr values were highly significant in confirming the presence of non-additive genetic variation for E. C. and No. Sh/E.C. Mean squares of Wr − Vr was highly significant, indicating non-allelic gene interaction (Table 7). A slope of the regression line did not differ from unity but significantly different from zero (b = 1.0393 ± 0.0173), indicating adequacy of the additive-dominance model to describe the variation in the % of embryogenic callus (Fig. 2a). The regression line cut the Wr axis above the origin point indicating partial dominance, while, for the number of regenerated plant per embryogenic callus, a slope of the regression line was 0.7463 ± 0.3725 which did not deviate from zero indicating the presence of non-allelic gene interaction. Fig. 2b revealed that the regression line for No. sh/E.C. cut the Wr axis below the origin point indicating over-dominance. The relative order of the Wr − Vr points along the regression line (Fig. 2a) showed that the P4 genotype possesses the highest proportion of the dominant alleles while the P6 containing a majority of recessive alleles. Meanwhile, the other parents revealed moderate proportions of dominant alleles for % E.C. Fig. 2b showed that the parent P3 possesses the highest proportion of the dominant alleles while the P6 containing a majority of recessive alleles. Meanwhile, the other parents revealed moderate proportions of dominant alleles for No. sh/E. C.
The D value measuring the additive component of variation was larger (471.626 ± 3.603) in magnitude than the value of H1 (328.563 ± 9.146) component indicating that the embryogenic callus in wheat was controlled by genes with mainly additive effects while dominance was also important, confirming of the Wr/Vr graph. The (H1/D)1/2 value approximating 0.835 indicated partial dominance. 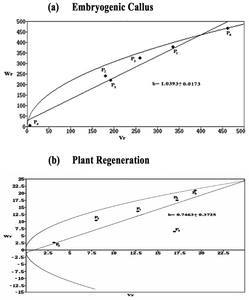 While, for the number of regenerated plants per embryogenic callus, the significance of D (25.269 ± 3.570) and H1 (28.106 ± 3.475) values indicated that both additive and dominance effects controlled plant regeneration, confirming the result revealed by Wr/Vr graph. The (H1/D)1/2 value approximated 1.055 indicating over-dominance (Table 8). The unequal allelic distribution among the parents for % E.C. and No. sh/E. C. is confirmed by the UV value being less than 0.25 (UV = 0.20 and UV = 0.218, respectively), which were indicated before from the “b2” item. The proportion of dominant and recessive alleles, gene ratio [(4DH1)1/2 + F/(4DH1)1/2 − F], in the parents for % E.C. and No. sh/E. C. was <1 (0.684 and 0.967, respectively) with a negative F value indicating that there are more recessive alleles in the parents than dominant. The results also revealed that approximately three genes or gene groups (h2 /H2 = 2.904) for % E.C. and two genes or gene groups (h2 /H2 = 1.04) for No. sh/E. C. is involved in the control of these traits in wheat. The high estimates of broad-sense (99.0%) and narrow-sense (83.1%) heritability for % E.C. and the high estimates of broad-sense (97.4%) and narrow-sense (69.0%) heritability for No. sh/E.C. indicated that a great proportion of the total phenotypic variation for these traits in wheat is genetic and these characters could be improved by crosses and selection. The mean values for 10 agro-morphological traits for the parents are summarized in Table 9. The significant differences (P ≤ 0.05 and P ≤ 0.01) among all genotypes in Table 10 indicating the presence of wide genetic diversity among these genotypes. The genetic distance ranged from 2.43 to 6.11 and the average (4.27) was relatively wide. The lowest genetic distance was between the parent P1 and P2 (2.43 GD) while, the highest genetic distance was between the parent P4 and P6 (6.11 GD). The dendrogram (Fig. 3) showed that the genotype P4 was separated in a single branch from the other genotypes. This genotype had the highest mean values for plant height, spike length, number of spikelets/spike, spike weight, number of grains/spike, spikelets fertility and 1000-grain weight while it had the lowest mean value for spike density. The remaining genotypes were divided into two clusters. Cluster-1 comprised of three genotypes P1, P2 and P3. In this cluster, the two genotypes P1 and P2 were closely related and had the minimum mean values for 1000-grain weight. Cluster-2 included the two genotypes P5 and P6 which had the lowest mean value for spike length and the number of spikelets/spike and the highest mean value for spike density. Mantel test, showed significant correlation (r = 0.82719; P ≤ 0.01) between agro-morphological and tissue culture traits. Pearson correlation analyses (Table 11) showed weakly positive correlations between C.% and each of E.C.% and No. Sh/E.C. while highly significant and positive correlation was found between E.C.% and No. Sh/E.C. Numbers of grains/plant and spike length showed positive and significant correlations with all tissue culture traits studied in this investigation. While the heading date and the number of spikelet per spike showed positive and significant correlations with C.% and No. Sh/E.C. Spike weight and spike fertility showed positive and highly significant correlations with E.C.% and No. Sh/E.C. Plant height showed positive and significant correlation with E.C.% only. Negative and significant correlations were found between spike density and the two tissue culture traits C% and No. Sh/E.C. Three different systems of DNA markers, RAPD, ISSR, and SRAP were used in this study to figure the genetic diversity in six wheat genotypes in their response to in vitro mature embryo culture. A total of 46 DNA fragments were amplified using six RAPD primers with an average of 7.67 bands/primer. Size of bands ranged from 141 bp (OPA08) to 850 bp (OPA10) (Fig. 4a). Of 46 amplified bands, 16 were polymorphic (34.78%), ranging from one (OPA10) to five (UBC01), with a mean of 2.67 polymorphic bands/primer. The percentage of polymorphic bands across the primers ranged from 10% (OPA10) to 55.56% (UBC01), with an average of 36.24% polymorphism (Table 12). RAPD primers were successful in distinguish five out of the six wheat genotypes by unique positive and/or negative markers, these markers ranged in size from 286 bp (OPI09) to 694 bp (UBC01) (Table 13, Fig. 4a). The polymorphism information content (PIC) values varied from 0.04 for primer OPA10 to 0.19 for primers OPAI09 and UBC01with a mean of 0.13 (Table 12). The low PIC value obtained by RAPD markers may be due to a low number of RAPD loci studied. The marker index (MI) values ranged from 0.04 for primer OPA10 to 0.96 for primer UBC01 (Table 12). The RP values ranged from 0.67 to 2.33 (Table 12). In the present study, UBC01 primer possessed the highest RP value (2.33), thus this primer was the best RAPD primers for distinguishing the genotypes. Mantel test showed a positive correlation between RAPD markers and each of agro-morphological and tissue culture traits (r = 0.66914 and r = 0.703; P ≤ 0.01, respectively). The RAPD markers used in this study were found to be quite effective in determining the genetic variations among wheat genotypes. Six ISSR primers yielded, fifty-four DNA fragments from all genotypes with an average of 9 fragments/primer. Size of amplified bands ranged from 972 (HB13) to 134 bp (HB) (Fig. 4b). Of total 54 bands, 17 (31.48%) were polymorphic. The primer HB08 gave the highest percentage (50.0%) of polymorphic bands while the lowest percentage (12.5%) was obtained by HB primer (Table 12). Among polymorphic fragments, unique positive and negative DNA markers were detected for all genotypes except P1 and P3 genotypes (Table 13, Fig. 4b). The PIC value ranged from 0.06 (primer HB) to 0.18 (primer HB08) with an average value of 0.11 (Table 12). The highest marker index (0.72) was observed for the primer HB08 and the lowest value (0.06) was recorded for primer HB (Table 12). The estimates of RP ranged from 0.67 (HB) to 2.0 (HB08) (Table 12). In the present study, HB08 primer possessed the highest RP value (2.0) indicating that this primer is the most informative primer for the characterization of different wheat genotypes. The correlation between ISSR and RAPD marker was positive and significant (r = 0.542; P = 0.001). In addition, positive correlations were observed between ISSR markers and each of the agro-morphological and tissue culture traits (r = 0.1798 and r = 0.364; P ≤ 0.01, respectively. Seventy-three DNA bands were generated using six SRAP primer combinations with an average of 12.2 bands/primer and ranged in size from 79 bp (SRAP-1) to 1354 bp (SRAP-6) (Fig. 4c). Of 73 bands, 31 (42.478%) were polymorphic. The % of polymorphic bands ranged from 28.57% (SRAP-4) to 50.0% (SRAP-6) (Table 12, Fig. 4c). Positive and negative unique markers were detected for all genotypes except P1 and P3 genotypes (Table 13, Fig. 4c). The PIC value ranged from 0.08 (primer SRAP-4) to 0.23 (primer SRAP-6) with an average value of 0.16 (Table 12). The highest marker index (1.6) was observed for the primer SRAP-6 and the lowest value (0.16) was recorded for primer SRAP-4 (Table 12). The two primers, SRAP-5 and SRAP-6 possessed the highest RP value (5.0) (Table 12), thus these primers have abundant informative for discriminating the genotypes. The correlations between SRAP marker and each of RAPD and ISSR markers were significant (r = 0.66 and 0.77; P = 0. 001, respectively). In addition, SRAP was found to be positive correlations with agro-morphological and tissue culture traits using the Mantel test (r = 0.4677 and 0.58; P ≤ 0.01, respectively). To obtain more accurate genetic information, the molecular combined analysis was executed. 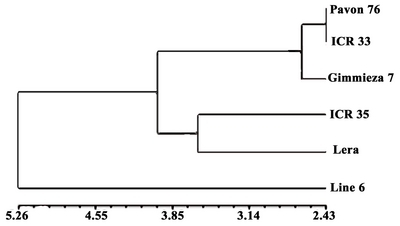 The dendrogram divided the genotypes into four clusters (Fig. 4d). Cluster-1 comprised of the three genotypes P1, P3 and P4, the two genotypes P1 and P3 grouped together in closely related with 0.95 genetic similarity, these genotypes had the lowest mean values for number of regenerated plant per embryogenic callus, while the genotype P4 which separated in a single branch from the two genotypes, had the highest mean values for E.C. % and No. Sh/E.C., PH, SP L, No Spkt/SP, No G/SP, SP W, 1000 GW and SP F. Cluster-2 included one genotype P2 which had the highest mean values for % of callus induction and the lowest mean values for PH and SPD. Cluster-3 contained only the genotype P5 which had the highest mean values for GY and the lowest mean values for % of callus induction, SP L and spkt/SP. Cluster-4 contained the genotype P6 which had the highest mean value for SP D and the lowest mean values for E.C. %, No. Sh/E.C., HD, GY, No G/SP and SP F.
A positive correlation between the three molecular marker systems (Mantel test, r = 0.05; P = 0.001) revealed that the three marker systems were suitable for identification and distinguishing wheat genotypes. Mantel test also showed a positive and highly significant correlation between molecular markers and each of agro-morphological and tissue culture traits (r = 0.468 and r = 0.627; P ≤ 0.01, respectively). The results showed that the DNA fragments at molecular size 743 bp (OPI09), 564 bp (OPW15) and 286 bp (HB15) were absent in the two genotypes P5 and P6 which had the lowest mean values for spike length, number of spikelets/spike, number of grains/spike and percentage of callus induction, this indicates that the absence of these alleles may be caused depression in these traits. DNA fragments at molecular size 322 bp (OPI09), 541 bp (HB08) and 1056 bp (SRAP-6) appeared only in the two genotypes P4 and P5 which had the highest average for plant height and %E.C. These fragments could be rendering as positive markers for these traits. Fragments at molecular size 630 bp, 465 bp (SRAP-2), 282 bp (OPW15), 384 bp (HB12) and 220 bp (SRAP-1) appeared only in the two genotypes P2 and P4 which had the highest mean values for No of sh/E.C., these fragments could be used as positive markers for regeneration ability. Tissue culture techniques are important tools and effective methods for plant breeding especially in wheat breeding programs. Different types of explant were used successfully in wheat tissue culture. Mature embryo is the best explant for wheat in vitro culture and it has been used widely in many wheat studies (Aydin et al. 2011; Mahmood and Razzaq 2017). Several factors such as genotypes and growth regulators are involved in response to tissue culture in wheat (Kowalska and Arseniuk 2016; Saha et al. 2017; Shahnam et al. 2017). In this study we used six genotypes of bread wheat, different concentrations of 2,4-D in callus induction medium and three combinations of BA and IAA in regeneration medium to study the response to mature embryo culture in different wheat genotypes. Significant genotype effect on callus formation, embryogenic callus formation and plant regeneration were observed in our study. This suggests that the three parameters are under the genetically control. Similar results were also reported by many researchers (Salama et al. 2013; Kowalska and Arseniuk 2016; Saha et al. 2017; Shahnam et al. 2017). Growth regulators play an important role in response to tissue culture. The results have demonstrated that the Growth regulators used for callus induction is not always optimum for plant regeneration as the nutritional requirements of the two phases of development may vary. Furthermore, this differential requirement was found to be genotype-dependent. In our study callus induction medium contained 4 mg/L 2,4-D was the best for callus formation and embryogenic calli from the mature embryos. These results support those as Munazir et al. (2010) who reported that 4.0 mg/L 2,4-D was the best for callus induction and the occurrence of variations in the frequencies of callus induction among genotypes. Transfer of non-embryogenic calli and embryogenic calli from callus induction medium to plant regeneration medium involved change of only the growth regulators. Within a genotype, significant differences affecting the plant regeneration was observed between the three types of regeneration media. Our results revealed that 0.1 mg/L IAA and 1 mg/L BA was the best combination for plant regeneration. Similar findings were reported by Salama et al. (2013) and Saha et al. (2017). Understanding of the type of genetic control of tissue culture traits in wheat is an essential aspect for many predicting the response to mature embryo culture to be used in further selection (Zamani et al. 2003; Abdel-Hady 2006). Our results revealed that the differences between the F1 hybrids and their parents were significant as indicated by the significance of “b1” item which revealing the presence of dominance directed towards higher E.C. % and greater No. Sh/E.C. In the present study diallel analysis revealed that both additive and dominant effects are involving in controlling embryogenic callus and plant regeneration traits. These results are in agreement with those of Lazar et al. (1984) and Khaled et al. (2013) in which, additive and non-additive gene action were involved in governing these traits. Meanwhile, Barakat (1994, 1996) found that both additive and non-additive effects were important in callus induction but non-additive effects were predominant. The importance of additive effects for callus induction and plant regeneration had also been reported with hexaploid triticale (Charmet and Bernard 1984) and maize (Bechert and Oing 1984). Barakat (1994) found that genotypic correlation between plant regeneration and callus formation was higher than the estimated phenotypic correlation, revealing the importance of the type of genetic associations. The presence of significantly positive GCA and SCA values suggested the utilization of certain genotypes P4 and P5 and crosses (e.g. P4 × P6, P1 × P4, P5 × P6 and P3 × P4) for improving the % of embryogenic callus and the genotype P4 with crosses P4 × P5, P4 × P6, and P1 × P4 for improving a number of regenerated plants per embryogenic callus. The results are in accordance with those of Abdel-Hady (2006) and Khaled et al. (2013) and the conclusion was drawn by Kalhoro et al. (2015) and Nawara et al. (2016). The high estimates of broad-sense and narrow-sense heritability for % E.C. and No. sh/E.C. indicated that a great proportion of the total phenotypic variation for these traits in wheat is genetic and these characters could be improved by crosses and selection. A similar finding was reported by Abdel-Hady (2006) and Khaled et al. (2013) who found high estimates of broad sense heritability and narrow sense heritability for % of embryogenic callus and number of regenerated plant per embryogenic callus. Agro-morphological and three different systems of DNA markers, RAPD, ISSR, and SRAP were used in this study to figure the genetic diversity in six wheat genotypes in their response to in vitro mature embryo culture. The genetic divergence among wheat genotypes based on agro-morphological traits was also reported by Ajmal et al. (2013) and Rahman et al. (2015). In this study, significant correlation (r = 0.82719; P ≤ 0.01) between agro-morphological and tissue culture traits was observed. Different correlations between tissue culture response and agro-morphological traits in wheat genotypes were observed by Khaled et al. (2013). The different associations between agronomic traits and tissue culture traits were due to the various factors such medium, hormones and explants which influencing on response to tissue culture through an effect on the quantitatively inherited traits and the various physiological processes behind them (Herrmann 2007). Specific DNA markers for particular wheat genotypes were observed using RAPD, ISSR and SRAP markers, such these unique bands were successful in distinguish the six wheat genotypes used in this study. Specific RAPD, ISSR and SRAP markers for particular wheat genotypes were observed by Bibi et al. (2009), Dong et al. (2010), Filiz (2012), Najaphy et al. (2012) and Abou-Deif et al. (2013), in studies on the genetic diversity among wheat genotypes. The RAPD, ISSR and SRAP markers used in this study were found to be quite effective in determining the genetic variations among wheat genotypes. These results were in agreement with previous studies (Dong et al. 2010; Abouzied 2011; Filiz, 2012; Khavarinejad 2014; Khaled and Hamam 2015; Razmjoo et al. 2015). Positive correlations were observed between three molecular marker systems and each of the agro-morphological and tissue culture traits. These results were in agreement with those obtained by Dong et al. (2010), Abouzied (2011), Filiz (2012), Najaphy et al. (2012) and Khavarinejad (2014). In Conclusion, these results revealed to the important of 2,4-D, IAA and BA in response to mature-embryo culture, also conclude that the additive and dominance gene actions are important for response to mature embryo culture. This study revealed the presence relationships between in vitro culture response and each of agro-morphological traits and molecular markers, which are very useful in breeding and crop improvement. The authors would like to deeply appreciate the support provided by the Faculty of Agriculture, Assiut University, Egypt. Fig. 1. Mature embryo culture in wheat where, (A) mature grains on callus induction medium. (B) Development of callus from mature embryos after 2 weeks of culture. (C) The growing callus covered the mature embryo. (D) Embryogenic callus with globular structures. (E and F) Embryogenic callus with green spots. (G and H) Differentiation plants from embryogenic callus. (I, J and K) Shoot elongation and development (L) Regenerated plants with shoots and roots from mature embryo culture in wheat and (M) Dendrogram based on Euclidian distance coefficient of 6 wheat genotypes, generated by three tissue culture traits. Fig. 2. Wr, Vr graph for (a) the % of embryogenic callus and (b) the number of regenerated plants/embryogenic callus in wheat. Fig. 3. Dendrogram generated from ten agro-morphological traits, based on Euclidian distance coefficient. Fig. 4. 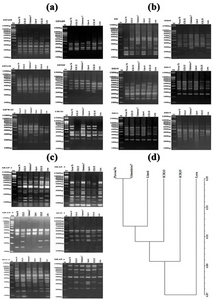 Gel electrophoresis (a) RAPD-primers (b) ISSR-primers (c) SRAP-primers in six wheat genotypes. (d) Dendrogram developed from the combined data of three molecular marker systems. 2,4-D: [2,4-dichlorophenoxy acetic acid (C8H8Cl2O3, M.W. = 221.04)]. IAA: [ndole-3-acetic acid (C10H9 No2, M.W. = 175.18)]. BA: [6-Benzyladenine (C12H11N5, M.W. = 225.25)]. The mean percentages of callus formation, embryogenic calli on the five types of callus induction media and the mean number of shoots/embryogenic calli on the three types of regeneration media. Mean square for the C%, E.C% and No of sh/E.C. The mean values of % E.C and the mean No of sh/E.C for the 6 wheat parents (diagonal) and their 15 F1 hybrids. The diallel analysis of variance for of % E.C and No of sh/E.C in the F1 generation. Significant at the 0.01 probability level. Estimates of general and specific combining ability for of % E.C and No of sh/E.C in wheat. % of embryogenic callus S.E.gi = 0.659 S.E.Sij = 1.494.
regenerated plants/embryogenic callus S.E.gi = 0.254 S.E.Sij = 0.555. Mean square of the (Wr + Vr) and the (Wr − Vr) values for % E.C and No of sh/E.C in wheat. Components of the genetic variations for the % E.C and No of sh/E.C in wheat. Mean values for 10 agro-morphological traits. Analysis of variance for 10 agro-morphological traits of six wheat genotypes. Correlations between agro-morphological and tissue-culture traits. PB: Number of polymorphic bands. PPB: Percentage of polymorphic bands. Positive and negative unique DNA bands. Abdel-Hady, AH (2006). Heterosis and combining ability effects for callus growth of wheat (Triticum durum, desf) in vitro. J Appl Sci Res. 2, 360-363. Abou-Deif, MH, Rashed, MA, Sallam, MAA, Mostafa, EAH, and Ramadan, WA (2013). Characterization of twenty wheat varieties by ISSR markers. Middle-East Journal of Scientific Research. 15, 168-175. Abouzied, HM (2011). Assessment of genetic diversity among wheat somaclonal variants lines using morphological traits and molecular markers. Afr J Biotechnol. 1, 14851-14861. Ajmal, SU, Minhas, NM, Hamdani, A, Shakir, A, Zubair, M, and Ahmad, Z (2013). Multivariate analysis of genetic divergence in wheat (Triticum aestivum L.) germplasm. Pak J Bot. 45, 1643-1648. Aydin, M, Tosun, M, and Haliloglu, K (2011). Plant regeneration in wheat mature embryo culture. Afr J Biotechnol. 10, 15749-15755. Barakat, MN (1994). Combining abilities of in vitro traits in wheat (Triticum aestivum L.) immature embryo culture. Euphytica. 76, 169-175. Barakat, MN (1996). Estimation of genetic parameters for in vitro traits in wheat immature embryo cultures involving high x low regeneration capacity genotypes. Euphytica. 87, 119-125. Bechert, M, and Oing, CM (1984). Results of a diallel trail and breeding experiment for in vitro aptitude in maize. Theor Appl Genet. 68, 247-251. Bibi, S, Dahot, MU, Khan, IA, Khatri, A, and Naqvi, MH (2009). Study of genetic diversity in wheat (Triticum aestivum L.) using random amplified polymorphic DNA (RAPD) markers. Pak J Bot. 41, 1023-1027. Charmet, G, and Bernard, S (1984). Diallel analysis of androgenetic plant production in hexaploid Triticale (X. triticosecale, Wittmack). Theor Appl Genet. 69, 55-61. Chen, J, Ma, P, Zhao, Y, Zhu, X, Cui, Y, and Zhang, Y (2009). Expression of auxin-related genes during dedifferentiation of mature embryo in wheat. Acta Agronomica Sinica. 35, 1798-1805. Chen, J, Yue, R, Xu, H, and Chen, X (2006). Study on plant regeneration of wheat mature embryos under endosperm-supported culture. Agric Sci China. 5, 572-578. Dice, LR (1945). Measures of the amount of ecologic association between species. Ecology. 26, 297-302. Dong, P, Wei, YM, Chen, GY, Li, W, Wang, JR, and Nevo, E (2010). Sequence-related amplified polymorphism (SRAP) of wild emmer wheat (Triticum dicoccoides) in Israel and its ecological association. Biochem Syst Ecol. 38, 1-11. Filiz, E (2012). Genetic diversity analysis of CIMMYT bread wheat (Triticum aestivum L.) lines by SRAP markers. Electronic Journal of Plant Breeding. 3, 956-963. Ghislain, MD, Fazardo, ZD, Huaman, Z, and Hismans, RH (1999). Marker assisted sampling of the cultivated Andean potato (Solanum fureja) collection using RAPD markers. Genet Resour Crop Evo. 46, 547-555. Greer, MS, Kovalchuk, I, and Eudes, F (2009). Ammonium nitrate improves direct somatic embryogenesis and biolistic transformation of Triticum aestivum. N Biotechnol. 26, 44-52. Griffing, B (1956a). A generalized treatment of the use of diallel crosses in quantitative inheritance. Heredity. 10, 31-50. Griffing, JB (1956b). Concepts of general and specific combining ability in relation to diallel crossing system. Aust J Biol Sci. 9, 463-493. Haliloglu, K (2006). Efficient regeneration system from wheat leaf base segments. Biol Plant. 50, 326-330. Herrmann, M (2007). A diallel analysis of various traits in winter triticale. Plant Breed. 126, 19-23. Jia, H, Yu, J, Yi, D, Cheng, Y, Xu, W, and Zhang, L (2009). Chromosomal intervals responsible for tissue culture response of wheat immature embryos. Plant Cell Tissue Organ Cult. 97, 159-165. Joshi, AK, Mishra, B, Chatrath, R, Ortiz, FG, and Singh, RP (2007). Wheat improvement in India: present status, emerging challenges and future prospects. Euphytica. 157, 431-446. Kaddem, WK, Marker, S, and Lavanya, GR (2014). Investigation of genetic variability and correlation analysis of wheat (Triticum aestivum L.) genotypes for grain yield and its component traits. Eur Acad Res. 2, 6529-6538. Kalhoro, FA, Rajpar, AA, Kalhoro, SA, Mahar, A, Ali, A, and Otho, SA (2015). Heterosis and combining ability in F1 population of hexaploid wheat (Triticum aestivum L.). Am J Plant Sci. 6, 1011-1026. Khaled, AGA, Hamam, KA, Motawea, MH, and El-Sherbeny, GAR (2013). Genetic studies on tissue culture response and some agronomical traits in Egyptian bread wheat. J Gene Eng Biotechnol. 11, 79-86. Khaled, AGA, and Hamam, KA (2015). Association of molecular markers with phenotypic traits of bread wheat genotypes. Egypt J Genet Cytol. 44, 115-130. Khan, AA, Alam, MA, Alam, MK, Alam, MJ, and Sarker, ZI (2013). Genotypic and phenotypic correlation and path analysis in durum wheat (Triticum turgidum L. var. durum). Bangladesh J Agril Res. 38, 219-225. Khavarinejad, MS (2014). Comparison of obtained wheat genetic divergence by molecular and morphological analysis using cluster. Scientia Agriculturae. 6, 107-113. Kowalska, L, and Arseniuk, E (2016). The effect of medium composition on callus induction and plant regeneration frequencies from mature embryos of wheat cultivars with various resistance to Parastagonospora nodorum. Indian Res J Genet & Biotech. 8, 183-189. Lange, CE, Federizzi, LC, Carvalho, FIF, Tavares, MJC, Dornelles, ALC, and Handel, CL (1995). Genetic analysis of somatic embryogenesis and plant regeneration of wheat (Triticum aestivum L.). J Genet Breed. 49, 195-200. Lantos, C, and Pauk, J (2016). Anther culture as an effective tool in winter wheat (Triticum aestivum L.) breeding. Russ J Genet. 52, 794-801. Lazar, MD, Baenziger, PS, and Schaeffer, GW (1984). Combining abilities and heritability of callus formation and plantlet regeneration in wheat (Triticum aestivum L.) anther cultures. Theor Appl Genet. 68, 131-134. Mahmood, I, and Razzaq, A (2017). Responses of explant type of wheat (Triticum aestivum L.) genotypes to different tissue culture media. Journal of the National Science Foundation of Sri Lanka. 45, 265-271. Mantel, NA (1967). The detection of disease clustering and a generalized regression approach. Cancer Res. 27, 209-220. Munazir, M, Qureshi, R, Ali, GM, Rashid, U, Noor, S, and Mehmood, K (2010). Primary callus induction, somatic embryogenesis and regeneration studies in selected elite wheat varieties from Pakistan. Pak J Bot. 42, 3957-3965. Murashige, T, and Skoog, F (1962). Revised medium for rapid growth and bioassays with tobacco tissue cultures. Physiol Plant. 15, 473-497. Najaphy, A, Parchin, RA, and Farshadfar, E (2012). Comparison of phenotypic and molecular characterizations of some important wheat cultivars and advanced breeding lines. Aust J Crop Sci. 6, 326-332. Nawara, HM, Mattar, MZ, Salem, KFM, and Eissa, OA 2016. Estimating heterosis and combining ability for agronomic and tissue culture traits using diallel cross on bread wheat (Triticum aestivum L.)., Egypt J. Bot. 6th International Con., 11–12 May, 2016, pp.177-200. Powell, W, Morgante, M, Andre, C, Hanafey, M, Vogel, J, and Tingey, S (1996). The comparison of RFLP, RAPD, AFLP and SSR (microsatellite) markers for germplasm analysis. Mol Breed. 2, 225-238. Prevost, A, and Wilkinson, MJ (1999). A new system of comparing PCR primers applied to ISSR fingerprinting of potato cultivars. Theor Appl Genet. 98, 107-112. Rahman, MS, Hossain, MS, Akbar, MK, Islam, MS, and Ali, L (2015). Genetic divergence in spring wheat genotypes (Triticum aestivum L.). Eco-friendly Agril J. 8, 1-3. Razmjoo, M, Mohammadi, R, and Shooshtari, L (2015). Evaluation of genetic diversity in durum wheat genotypes (Triticum turgidum var. durum) using ISSR markers. J Biodivers Environ Sci. 6, 522-529. Ren, JP, Wang, XG, and Yin, J (2010). Dicamba and sugar effects on callus induction and plant regeneration from mature embryo culture of wheat. Agric Sci China. 9, 31-37. Saha, S, Islam, Z, Islam, S, Hassan, MF, Hossain, MS, and Islam, SMS (2017). Enhancement of Somatic Embryogenesis by Mature and Immature Seeds in Wheat (Triticum aestivum L.). Journal of Biology and Life Science. 8, 20-31. Salama, EA, Abido, AIA, Khaled, AE, and Abdelsalam, NR (2013). Embryo callus induction and regeneration of some Egyptian wheat cultivars. Res J Agric Biol Sci. 9, 96-103. Shahnam, AD, Uliaie, ED, and Bandehagh, A (2017). Callus induction and plant regeneration from mature embryos of some Iranian wheat (Triticum aestivum L.) genotypes. J Bio and Env Sci. 10, 275-283. Sharma, VK, Hänsch, R, Mendel, RR, and Schulze, J (2005). Influence of picloram and thidiazuron on high frequency plant regeneration in elite cultivars of wheat with long-term retention of morphogenecity using meristematic shoot segments. Plant Breed. 124, 242-246. Tonk, FA, Tosun, M, Ilker, E, Istipliler, D, and Tatar, O (2014). Evaluation and comparison of ISSR and RAPD markers for assessment of genetic diversity in triticale genotypes. Bulgarian Journal of Agricultural Science. 20, 1413-1420. Walter, DE, and Morton, JR (1978). On the analysis of variance of a half diallel table. Biometrics. 34, 91-94. Yu, H, Wang, W, Wang, Y, and Hou, B (2012). High frequency wheat regeneration from leaf tissue explants of regenerated plantlets. Adv Biosci Biotechnol. 3, 46-50. Yu, Y, Wang, J, Zhu, ML, and Wei, ZM (2008). Optimization of mature embryo-based high frequency callus induction and plant regeneration from elite wheat cultivars grown in China. Plant Breed. 127, 249-255. Zamani, I, Gouli-Vavdinoud, E, Kovacs, G, Xynias, I, Roupakias, D, and Barnabas, B (2003). Effect of parental genotypes and colchicin treatment on the androgenic response of wheat F1 hybrids. Plant Breed. 122, 314-317.